Run, run as fast as you can, it's time to write about the Gingerbread Man! This activity has gingerbread person writing organizer to help create an original gingerbread story. 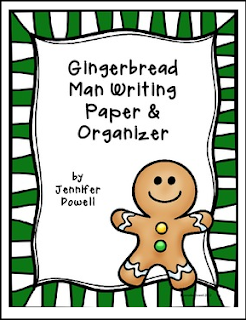 There is a cover and writing paper with lines that are in the shape of a gingerbread man attached. It can be used to write the published copy of the student's gingerbread story. Just make multiple copies of the lined paper. I hope your kids enjoy writing their own gingerbread story! Gingerbread Man Nonstandard Measurement, The Gingerbread Man Loose in the School Math Word Problems, and Gingerbread shaped writing paper and organizer.